When the LSI(L) 1091 beached in Humboldt Bay on Dec. 12, 2016 she did not drop the stern anchor and pay out cable or make other preparations to retract. 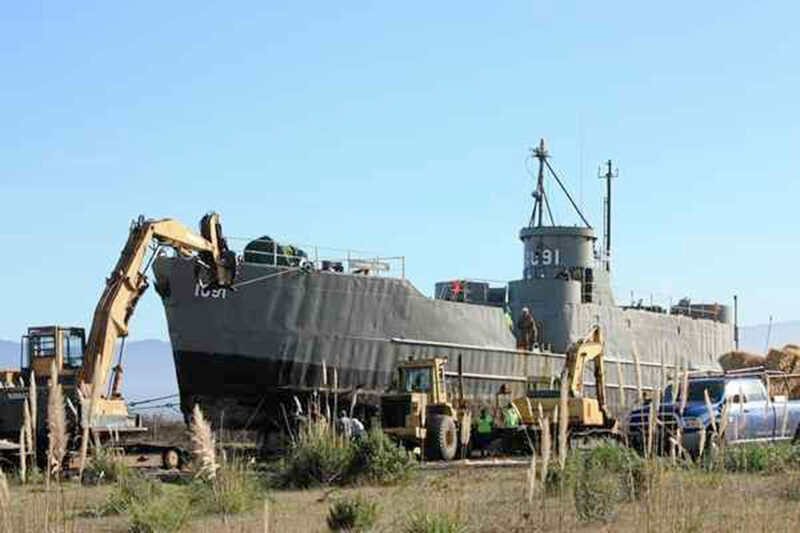 From now on the 1091 of the Humboldt Bay Naval Air/Sea Museum was scheduled for shore duty. At high tide on that December day the ship was hauled out of the water, rolled up on logs to her permanent duty station as a maritime museum. For those who attended California LCI reunions in Eureka, CA between 1996 and 2011, you will know the location; it’s near the Samoa Cookhouse just across the bridge. The 1091 is now next to a Railroad museum in a developing historical area. More likely you will remember those lumberjack breakfasts served family style at the Samoa Cookhouse. And Doc Davis tells me they are still serving. The original plan, to use roller air bags to take the ship ashore, was scrapped in favor of logs. And in the heart of the Redwoods, logs are in good supply and cheaper. At high tide with logs in place a couple D-8 Caterpillars pulled the ship up on the beach, high and dry. The move was necessary. The last time she was in dry dock was in 1995, just before Doc Davis with a crew of LCI vets sailed the 1091 to San Diego for the LCI reunion. Some of you may have been there; 950 were registered in the largest LCI reunion ever. Over 2,000 signed the ship register and a few thousand more toured the ship while she was in port. But time and saltwater take their toll on ships of iron, and now the yards in Coos Bay, OR were too many nautical miles away and the much-needed hull work too expensive. So, shore duty was the only feasible alternative. Restoration will continue piece by piece by a group of dedicated volunteers. The ship will still be available for visitors and special events such as patriotic holidays. In the past, the ship has also been the site of swearing in ceremonies for Navy recruits. Capt. Mark Neeson, USN Ret., who is also on the Board of the Museum, administers the oath of service. Dr. Ralph Davis, of McKinleyville, CA with the 1091 after haul out near the Samoa Cookhouse in Eureka. 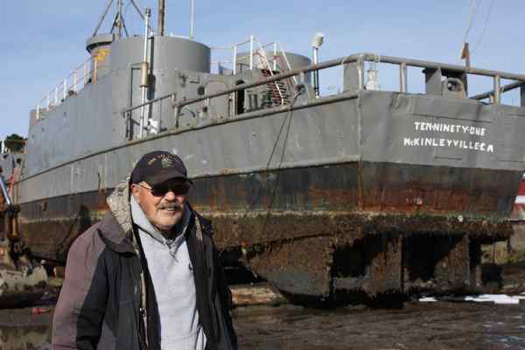 Doc Davis purchased the ship for fishing but donated it to the Humboldt Bay Naval Air/Sea Museum. Courtesy of Eureka Times-Standard. My father served on the USS L.C. (F.F.) 1083 during WWII. Would love to see your progress on the USS LCI 1091. Is a tour possible? I live in AZ but come to the Bay area frequently.